Uwe D. Hanebeck (IEEE, StM'89-M'91-SM'13-F'17) is a chaired professor of Computer Science at the Karlsruhe Institute of Technology (KIT) in Germany and director of the Intelligent Sensor-Actuator-Systems Laboratory (ISAS). From 2005 to 2015, he was the chairman of the Research Training Group RTG 1194 'Self-Organizing Sensor-Actuator-Networks' financed by the German Research Foundation. Uwe D. Hanebeck was the General Chair of the '2006 IEEE International Conference on Multisensor Fusion and Integration for Intelligent Systems (MFI 2006)', Program Co-Chair of the '11th International Conference on Information Fusion (Fusion 2008)', Program Co-Chair of the '2008 IEEE International Conference on Multisensor Fusion and Integration for Intelligent Systems (MFI 2008)', Regional Program Co-Chair for Europe for the '2010 IEEE/RSJ International Conference on Intelligent Robots and Systems (IROS 2010)', General Chair of the '19th International Conference on Information Fusion (Fusion 2016)', General Chair of the 'IEEE International Conference on Multisensor Fusion and Integration for Intelligent Systems (MFI 2016)', and Program Co-Chair of the '2017 IEEE International Conference on Multisensor Fusion and Integration for Intelligent Systems (MFI 2017)'. 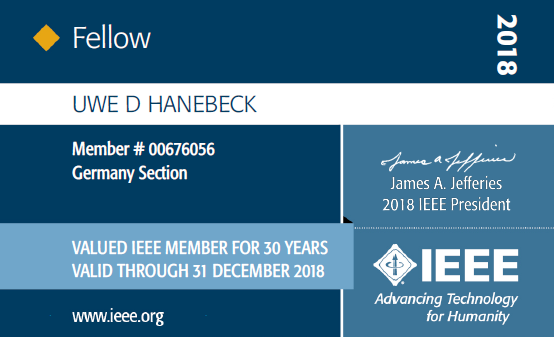 Prof. Hanebeck is a Member of the Board of Directors of the 'International Society of Information Fusion (ISIF)', Editor-in-chief of its 'Journal of Advances in Information Fusion (JAIF)', and associate editor for the letter category of the 'IEEE Transactions on Aerospace and Electronic Systems (TAES)'. He is a Fellow of the IEEE. Author and Coauthor of 473 publications: At conferences 363, in journals 52, in books 24, editor of books or journals 6, preprints 23, other publications 3. For details, please see publications page. 07/2017 ISIF Conference Technical Contributions Award for contributing 50 or more FUSION Conference Papers from 1998 to 2017. Presented at the 20th International Conference on Information Fusion (Fusion 2017) in Xi'an, China. 07/2017 ISIF Conference Service Award for Contributions to FUSION Conference Organizations in the period from 1998 to 2017. Presented at the 20th International Conference on Information Fusion (Fusion 2017) in Xi'an, China.